Hinges specifically designed for kitchen cabinets and the like. Hinges that allow the door face to sit level with the cabinet face. Hinges that allow the doors to overlay the frame of a cabinet so that the door hides the cabinet carcass from view. The part of a modern Euro Cabinet Hinge that fits into a 35mm dia hole in the back of a cabinet door. The part of a modern Euro Cabinet Hinge that joins the hinge Cup and the Backing Plate. The part of a modern Euro Cabinet Hinge that mounts on the side of the cabinet body or carcass. Below is a sketch of a plan section through some hinges to explain the terms Overlay and Inset . Cabinet Door Hinges : Hinge overlay and inset. The darker grey is used for the doors and the lighter grey is used for the cabinet panels. The yellow represents the Hinge Cups, the blue is the Hinge Arm and the green areas denote the Mounting Plates. At the left is what is known as a Full Overlay Cabinet Hinge. That is the hinge is designed to allow the door panel to overlay the frame panel fully and hide it from view. In the middle is what is known as a Half Overlay Cabinet Hinge which allows two doors to overlap one panel of the cabinet carcass. At the right is a door that uses an Inset Cabinet Hinge.This allows the door to sit into the frame so that the face of the frame and the door are level. It is important to note that even though the hinges look the same at a casual glance, there is a large variety of hinges to suit many applications. Note the differing thickness's and reach of the arms of the hinges. More control is also given by using different backing plates. So when selecting hinges get the help of an expert or use the manufacturers printed data, as it is easy to get confused. They all look very similar in the package. It may sound confusing, but the fact that the manufactures (the good ones at least) provide so many combinations of hinges is what makes modern cabinets so versatile. Cabinet Door Hinges : A hinge for a Bi-Fold Door to a corner cabinet. On of the great benefits of modern cabinets is their easy modularisation. Here we see the hinge for the bi-fold door section of a corner module. Cabinets modules are not just used by flat pack manufacturers, but by just about all modern cabinet shops. Two straight modules can be added to each end of a corner unit to make an "L" shaped cabinet. Cabinet Door Hinges : An overlay hinge at what is known as a "Blind Corner". The images above introduce what cabinetmakers call a Blind Corner. That is a section of the front of a cabinet that is fixed. Not a movable door. These are fairly rare but they do give extra space in wardrobes without adding to the weight of the doors. If you compare the two you will also see the difference between the overlay and inset types of hinges. The clip-on hinge comprises of two main parts, the hinge which is mounted in a circular hole in the door and the mounting plate which is fixed to the cabinet. In the sketch above the mounting plate is a common form known a Cruciform Plate , (like a cross). Above is a sketch showing the methods of adjusting the hinges. The only tool needed is a small phillip's head screwdriver. The height adjustment is down by turning a screw on the mounting plate. 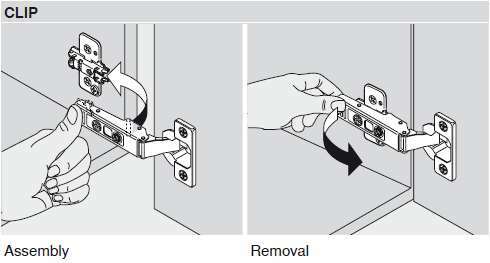 Older or different mounting plates don't have this facility but they do have slots for the screw holes so that they can be loosened and then tightened when the door has been moved. Side adjustment is done by screwing in or out a screw mounted on the hinge arm. This pushes against the mounting block, giving the effect of a thicker or thinner block. The depth adjustment is also a screw on the hinge arm.